Today I am getting into the dirt and planting food. I’m not doing it by myself. Our housemate Scott and eight year old friend Nick are planting and getting nice and dirty with me. Big fun. My husband Thor loves to cook (and not get dirty) so he gets excused from gardening. I don’t understand why he pulls away from the affectionate hugs I offer as I’m planting. He is so cute I keep trying anyway. We’ve got in pots on the patio: two little apple trees, a pear tree, lots of strawberry and blueberry plants, a gooseberry and a raspberry bush. It all looks like a bunch of sticks this early in the year, except for the strawberries. The Willamette Valley’s rich soil and reliable rain will help transform all these bare, spindly branches into delicious food, with the grace of God. I give a lot of credit to the Creator around the miracle of life. Why do hours of hard physical work to grow at most a couple hundred dollars worth of food per season? Because it’s FUN! Moreover, it creates food security. City-dwellers forget that food doesn’t grow in grocery stores. Even a week-long collapse of oil or gas supplies could send us into shortages and chaos. Another way to increase our food security is to eat less, i.e. more moderately. My favorite writer about food-growing is Barbara Kingsolver and her book and website Animal, Vegetable, Miracle. My husband Thor and I love to have people over for dinner. At the same time I’m addicted to sociability, I ‘m also passionate about choosing food with the smallest possible carbon footprint (similar to ’embodied energy’). Our guests keep coming back, so I gather our cooking tastes pretty good. Sidebar: When it comes to a quick bite out, we find that Burgerville is very diligent about sourcing from local farmers. And I understand they treat their employees well, too. Last night some friends and I had one of our periodic ‘Green Girls’ dinner parties at my friend Colleen’s house. We had a blast sharing news, laughter, viewpoints and encouragement around sustainability. 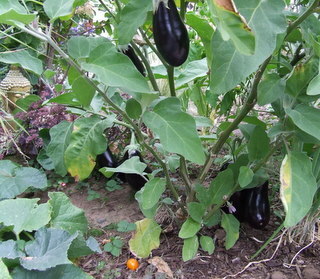 Colleen’s meatless eggplant mousakka was a hit. Coming up next: conserving embodied energy in Cooking For Climate Change, Part 2.